If my mother saw me eating this, she would scream. When I was a kid, none of my food could touch. Sometimes we would have Swanson’s TV dinners and one section would invade the other; she would have to cut all of the mixed stuff out. And even then, I wasn’t happy because the molecules had been in contact. This was one of the first bowls I did. It was originally a bento box and I wondered how it would taste together. I was super surprised that I liked the combination, especially the rice and the cabbage salad. This is another recipe that can work in a tiny kitchen: you only need one burner —or a rice cooker—and a toaster oven for the meatballs. Meatball options: I have been using ground chicken breast. I seem to like the kind of mild flavor here, but you could really use any kind of ground meat— pork, turkey, even tofu. I’m also thinking about swapping out the scallions for chives or chopped spinach. Rice options: I used basmati when I took the picture because I’m trying to use up a ridiculously enormous bag I bought at an Indian market. I usually make it with short grain sushi rice, but I would really be happy with any rice— even brown rice. I also think quinoa would be a good option. Cabbage salad options: This can really be anything. I used savoy and red cabbage, but green cabbage or napa or any cabbage you want will work. I have been adding carrot and scallions, but you could really use a lot of different things: peppers, radish, what else? kale? Sauce options: You can use store bought hoisin sauce to coat the meatballs if you have one you like. I used to have one I liked, but it disappeared, so now I make one that is a little more tomatoey than most traditional ones. You could also add peppers or Sriracha to the sauce to take heat level up. Time note: The meatballs take me around 10-15 minutes to make and then 25-30 minutes in the oven. Everything else comes together while the meatballs cook— unless you use a rice cooker, in which case the rice can take around 50 minutes. Get the oven going at 400º F and then start on the meatballs— unless you’re using a rice cooker, then get the rice going first. In a large bowl, beat the egg. Finely mince three scallions (white to light green parts) mince or run through the garlic press one to four cloves of garlic depending on taste (I used four) and mince or grate a tablespoon or so of ginger. Add all of this plus a half cup of Panko to the egg. Now I get my sheet pan out and put it next to the bowl. Add the ground chicken and mix everything together. I usually make the meatballs around two inches diameter, giving me around fourteen meatballs. They’ll spend about 30 minutes in the oven to get brown. If you’re doing the rice on the stove top, get the pot going on high and mix one tablespoon of canola oil and two cups of rice in the pot stirring for a minute to coat the grains before adding three cups of water. Bring to a boil and then cook on low for 20 minutes. Now get the cabbage salad ready. Finely shred (I used a little hand-held mandolin) around four cups of Savoy cabbage, put in a large bowl, and coat with around a half cup of rice vinegar. Finely shred around cup of red cabbage and add that, then grate a large carrot and add that, then finely slice three scallions (white and light green parts) and add that, tossing after each addition. Then finely slice the two remains scallions on a diagonal and set aside to garnish. Toss in two tablespoons of toasted sesame oil. Set the salad aside but keep tossing it every few minutes while you make the sauce, tasting once or twice to see if it needs something more. Sometimes I add a little sugar, sometimes I add some red pepper flakes. I usually make the sauce in a two cup Pyrex measuring cup. Combine two tablespoons of brown sugar or honey with two tablespoons of rice vinegar to dissolve and then add around a half cup of ketchup or chili sauce, around a quarter cup soy sauce, and around two tablespoons of orange juice (I only add this if I have it around). Taste it to see if you want to add more soy sauce or whatever. By now the meatballs should be done. In a bowl, toss the meatballs until coated with however much sauce you want. 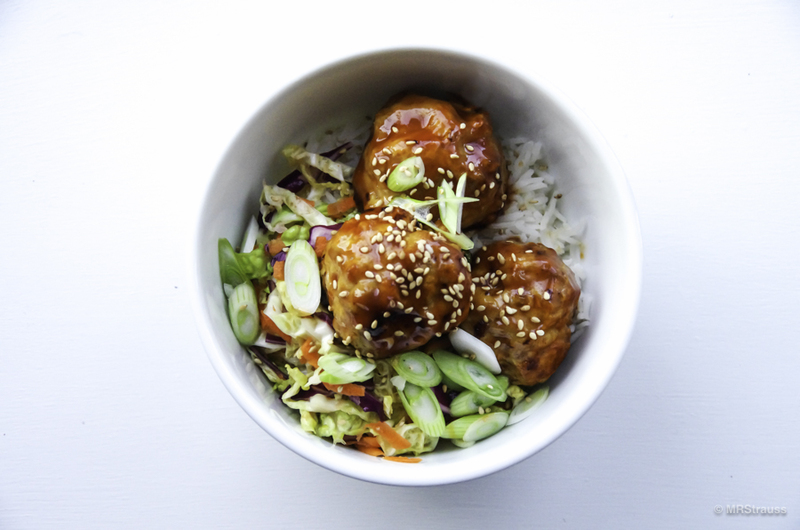 Then you can layer the rice, cabbage salad, meatballs and top with scallions and toasted sesame seeds. I try to pause for a moment her to appreciate how cool it looks before I dig in. This entry was posted in Bentosh and tagged Cabbage, Ground Chicken, Hoisin, Rice on April 28, 2016 by mrstrauss.